Birthmother’s Day is celebrated the Saturday before Mother’s Day. It originated in 1990 by a group of birthmothers in Seattle, Washington..
Visit our website for more information and to get support, advice, or anything you need! Birth Mom Missions is recognized by the Internal Revenue Service as a 501 (c)(3), non-profit corporation. We hold ourselves accountable to donors, supporters, churches and foundations to use the resources they contribute wisely, responsibly and in service of our mission. 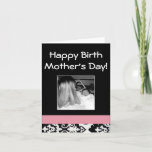 End Note: I know I am a "birthmom", so it may look tacky to be promoting it and all. It's would be like your mom reminding you that mother's day is this Sunday. But, since there aren't quite as many people rushing to the store to find the perfect birth mom's day card, and 80 % of the population has probably never heard of it, I think it is okay this time to promote! The reason for this day is not, in my opinion, because mother's day is a sad day for us so we need another day in order to make us feel included. If that were the case, we might not make it long as a birth mom anyway, cause part of the sacrifice is in letting go of what we most desire for the good of our kid. Personally, I love mother's day just as much as birth mom's day. See... finding the perfect mom for our child(s) was kinda the whole point of this adoption thing, for most of us anyways. I am very proud of my daughter when I think about her celebrating her mom every year. I picked her mom, so I know she is pretty awesome. And I can't imagine how it must feel to receive a handmade gift from a child! Mother's day for me, honors the woman I chose to trust with my life. She is in charge of the most important person to me. I respect her enormously. This day is more of a way to remind people that the "other mother" isn't scary, she's real, and it's ok to mention her. If I could tell my daughter one thing on birth moms day it would be, "Look how extra special you are. You are loved so much, that they had to make an extra day to fit everyone who loves you in!" But that's just me. But I sure don't sugar coat adoption either, the truth would of always been nice to here from the beginning. Adoption reform is on our agenda too! My first birth mother's day was pretty hard. I didn't know what to expect or to feel. It was just days after the adoption, so it was a lot of changes to take in at once. I just wish I had had another birthmom or someone around me who understood what it felt like then. So I hope I we, birth mom missions, can be that support for a woman who needs it now. I mean nothing happened on that day except for me doing a lot of thinking and crying. I was happy, sad, confused, worried, excited, grateful, well all of it! But the one thing I remember most is the feeling of being totally alone. The person I love most in life was suddenly gone (after 9 months of being connected to me), and since most people didn't know what to say to me, they stayed away that day for fear they might upset me. (btw, no no one's ever upset me if they are honestly trying to offer support) I'm upset already! And not because of any silly day or the words someone random might say. I'm upset, going to be upset, and probably will remain upset for the rest of my life. I'm missing a huge piece of me for cying out loud. No words could ever evoke a deeper emotion in me. We are upset, rightly so, and may be forever. But I will live. Part of what I love about being a "mother" is the capacity that comes out of no where suddenly, to love my child. I know adoption isn't perfect, and I do wish I had been told before the adoption some of the things I know now. And I have no clue how the rest of our adoption, or our lives will turn out, but I believe, in some way, I can still help make her future the best it can be. Luckily I'm creative, so I shouldn't run out of things to do! I hope that one day adoption is understood, explained, and represented how it should be. I want her to know, ALL her parents aren't perfect, but that when it came to her we always tried to give her the very best. Maybe we were wrong and it hurts her now that her mom placed her for adoption....but that is in the past. All we can do is learn the most we can from it and do everything possible to love you today. Moms talk about how they need a break for their kids (I don't blame you, my mom needed plenty of breaks from me too). But on birth mother's day, take a moment to just remember how lucky you are to have them. They grow up so fast. Please love them with everything you have inside and give one extra hug to them on this day, from us to them. Thank you for being you, whoever you are and wherever you fit into this grand adoption scheme of things! If you're adopted your Birth Mother LOVES YOU ! And become a member of the mission and receive your passcode for our member only adoption pages!